BoroughBees: Got any plans for Saturday? If not, there is a whole bunch of cool beekeeping and urban ag stuff going on! 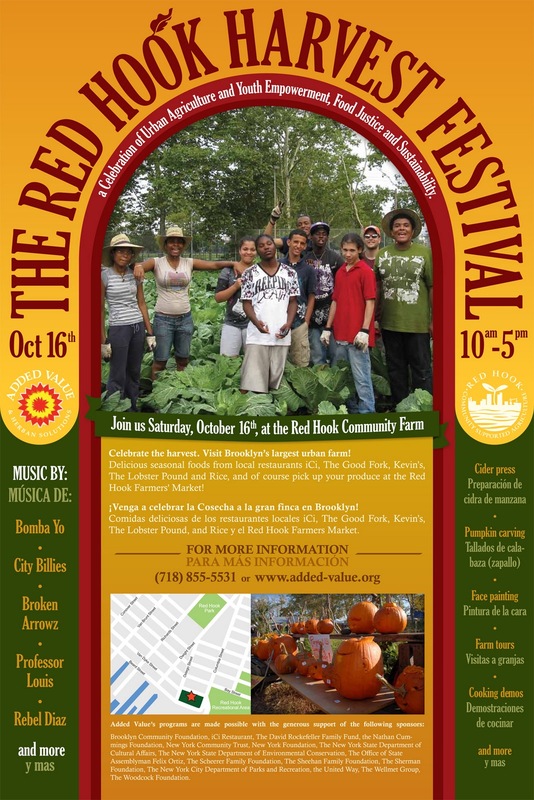 First, the 5th annual Red Hook Farm Harvest Festival is this Saturday from 10AM to 5PM. Featuring such activities as pumpkin carving and stuffing your face with food from The Good Fork, iCi, Rice, Kevin's and the Lobster Pound, there will also be live music performed by Bomba Yo!, Professor Louis, The Broken Arrowz, Rebel Diaz and more. On top of that, add a bunch of kid friendly activities (not the kid at heart kind), a locally sourced farmers market and seasonal food cooking demonstrations, and you've got a full (and fun) day. I love being swarmed with questions so all of you should come out! Last festival I did, I was so busy answering questions that I didn't have time for a breather until 6, and I'm looking forward to repeating the performance at Added Value on Saturday! This is a great opportunity to see where honey comes from (whether or not you are a budding beekeeper). Michael Hegedus, President of the Brooklyn Beekeepers Club, will bring his extractor to The Commons and show us step-by-step how to get the honey from the hive into little jars. It's only 5 dollars, so if you're going to be in Brooklyn for the Harvest Festival on Saturday and want to see how honey is extracted, this is worth a look-see. I'll be manning the honey bee table at the Harvest Festival, so I won't be able to attend, but it'll be a good opportunity to meet more beekeepers and ask lots of questions!